Talladega Superspeedway is home to two annual NASCAR Sprint Cup Series weekends. NASCAR ramped up its pre-race excitement level for the 2014 season, making qualifying more relevant and much more entertaining by introducing a highly competitive "knockout" system, beginning with 43-plus race cars on the track at the same time at tracks 1.25 miles or longer. 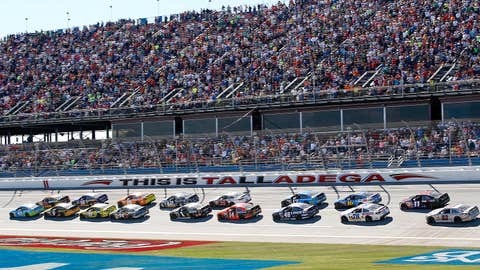 NASCAR on FOX, which covers the first 13 NASCAR Sprint Cups Series of the season, is showing its enthusiasm for the new system, moving the May 3 NASCAR Sprint Cup Series qualifying at unpredictable Talladega Superspeedway from FOX Sports 2 to FOX, marking the first time a non-Daytona qualifying session has aired on FOX. "This move is a direct result of the double-digit ratings gains NASCAR’s new knockout qualifying format is delivering every weekend," said Bill Wanger, EVP of Programming, Research & Content Strategy. "We are thrilled to be able to highlight this new format on FOX, and what more exciting place to do that than Talladega Superspeedway." The new qualifying system, which moves away from single-car qualifying and is supported by double-digit, year-to-year ratings growth, allows for all cars to qualify collectively for up to 25 minutes, with the top 24 based on fastest laps advancing for a subsequent 10-minute session. The top 12 from that group advance to the final, five-minute round. The 90-minute Talladega qualifying session begins on FOX on Saturday, May 3 at 1 p.m. ET.